Last week President Obama signed a funding bill into law that included an unprecedented $122 million increase to Alzheimer's research, education, outreach and caregiver support. The increase includes a $100 million increase for the National Institute on Aging dedicated to Alzheimer's research. What is important to note, this funding bill had to pass through both the House and the Senate before arriving on the President's desk, and in the event you have been living under a rock - they haven't quite been agreeing on much lately. Congress doesn't just sneeze out $122 million for any and every important cause. This increase, has been years in the making - blood, sweat, lots of tears and hours and hours of work by Alzheimer's Association staff and volunteers. We have gotten savvier with our media strategies - including social media and advertising to get some attention. All organizations have access to similar infrastructure. But, the true and ultimate GAME-CHANGER is our nationwide network of more than 600,000 passionate and dedicated advocates who are working within their communities to recruit more advocates and share their message of a world without Alzheimer's. Our ground-swell is what will help us ultimately achieve our vision and end this disease. But, we need you. We need your VOICE. Help us turn the tide against Alzheimer's. Add your VOICE now. Not an advocate? Register HERE! Stay tuned to our Community Calendar for the latest education and support events! Walk to End Alzheimer's planning committees are organizing all across the state. Join their efforts! Have you seen our website for individuals with Alzheimer's disease? Find it here. It never dawned on me that making a chicken in a crock pot would be possible, not to mention delicious! But during the great water crisis, my few meat choices included a whole chicken. Since I usually am cooking for one or two I never buy a whole chicken - but this won't be the last time! Susan, our finance director gave me this great recipe. Slice the onion into large half moons, and rough chop the carrots and celery. Dump all of the vegetables into the bottom of a large crock pot. Wash the chicken and pat dry - make sure you remove the giblets! Place the chicken on top of the vegetables. Pour in chicken stock, then seasonings. 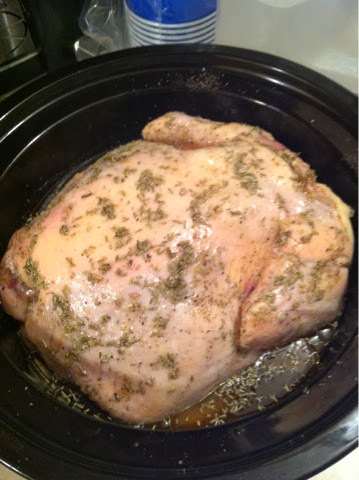 Cover and turn on the crock pot for 5 hours or until the chicken is done. It literally falls off the bone!